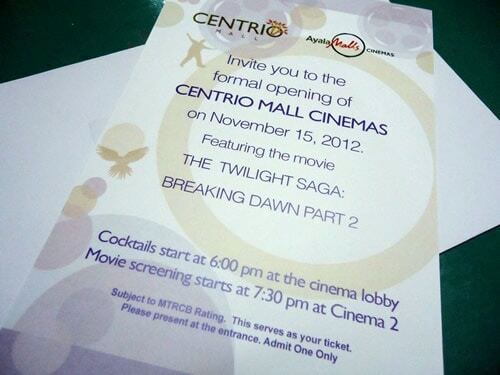 The newly opened Ayala Centrio Mall in Cagayan de Oro City will be formally opening its world-class cinemas this coming November 15, 2012 (thursday) in time for the release of the blockbuster movie Twilight Saga Breaking Dawn part 2. Yours truly is officially invited to the formal opening of the cinema. I have toured the cinema before it opening last November 9, 2012 and its at par with the Ayala Cinemas in Manila with sure seats and superb sound because of its compact size. Ayala cinema in Centrio Mall will definitely become the popular place to watch movie with friends and love ones.